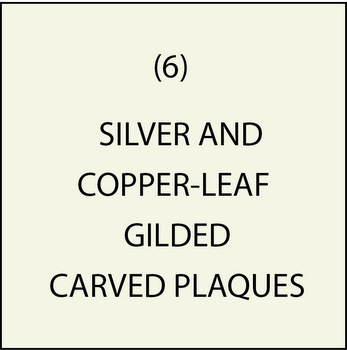 This section shows a few of our signs & Plaques that have been gilded with fine silver or copper leaf. Silver has long been valued as a precious metal. More abundant than gold, silver metal has functioned in many pre-modern monetary systems as coinable specie, sometimes even alongside gold.The stability of the Roman currency relied to a high degree on the supply of silver bullion, which Roman miners produced on a large scale. Silver has been used for thousands of years for ornaments and utensils, trade, and as the basis for many monetary systems. In the Gospels, Jesus' disciple Judas Iscariot is infamous for having taken a bribe of 30 coins of silver from religious leaders in Jerusalem to turn Jesus of Nazareth over to soldiers of the High Priest Caiaphas. Silver's value as a precious metal was long considered second only to gold. Silver is produced during certain types of supernova explosions by nucleosynthesis from lighter elements through a form of nuclear fusion that produces many elements heavier than iron, of which silver is one and gold is another.The silver on your sign or plaque was produced several billions of years ago from an exploded star. Silver leaf is silver that has been hammered into thin sheets by beating and is used for gilding. Silver's purity is typically measured on a per-mille basis; a 94%-pure alloy is described as "0.940 fine". We purchase this quality of silver leaf. Silver has a brilliant white metallic luster that can take a high degree of polish It glimmers in the light and attracts attention from long distances. Protected silver has higher optical reflectivity than aluminum. We use silver leaf gilding for raised and engraved text, borders, and 3D and 2.5D bas-relief artworks. Gilding is an ancient art of gluing extremely thin sheets of silver onto a curved surface. This is a process that must be done manually by our skilled and experienced artisans. Silver-leaf gilding dates back to ancient times. Traditional gilding is the most difficult and highly regarded form of silver leafing. It has remained virtually unchanged for thousand years and is still done by skilled craftsmen. Unlike gold, silver will oxidize over time, losing some of its luster, and must be protected with a clear coating..
By purchasing a sign or plaque that has silver-leaf gilding, you will own a piece of art that has a noble artisan heritage thousands of years old. We also use copper leaf to gild smaller features on our signs and plaques, such as 3D appliques and raised text. Copper-leaf gilding uses the same process as gold and silver-leaf gilding. Because we also have the capability of applying a copper metal veneer to the entire sign or plaque, which requires less labor and has a more uniform appearance, we do not use copper leafing very often. We use gold and silver-leaf gilding much more because we do not have these metals available for our coating process; if they were available, they would be very expensive. The section starting with M7201 in this gallery shows our copper-coated signs & plaques.